“Don’t overdo it,” Marianna said as she stepped up next to her. “I’m going in,” then without missing a beat, Bree jumped off the building. Bree reached into her hair and clasped onto the green bow that Blaze had given her before they left. As she fell, she squeezed her eyes shut and remembered watching Marianna transform at the mall. She remembered her bracelet snapping apart and a purple energy emitting from the pieces. Something like that would happen right now, right? Blaze had said as much, anyway, after giving one of those the power is inside of you speeches. The words had sounded so cheesy at the time, but as Bree held onto the bow in her hair, she swore she could feel something bubbling up inside her chest. It was a warm energy, something that was eager to come out and show that terrible monster what she could do. She wished with every fiber of her being that she could’ve felt something like this with her own attack. All she’d felt that day was a cold sense of fear that left her shaking and crying until Marianna had come to her rescue. She was definitely thankful for Marianna’s presence, but Bree wished that she could’ve protected herself. No, it was more than that. She wished she could’ve shown that thing why no truly meant no. Just like Marianna’s bracelet, Bree’s hair bow shattered with the pieces swirling around her. The pieces digitized into several bits, looking like they came out of an old video game. Retro. The word was retro, that’s what Ella would say. Bree closed her eyes as she fell through the bits of green. Bree’s hair tie broke as her hair flowed around her, the brown shifting into a shimmering green. Her clothes dissolved away as the power washed over her, creating a new look. Not just a new look: a new Bree. You can actually watch Briana reading more from this snippet! 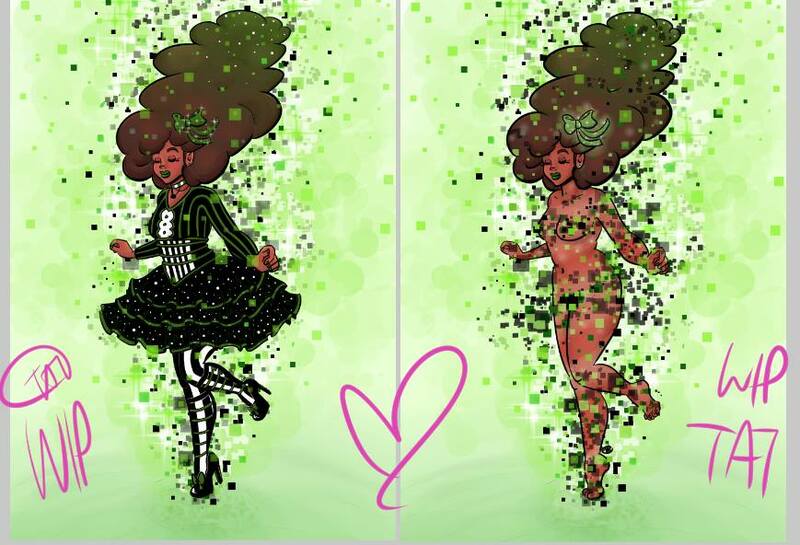 Click on the image of Cosmic Green’s transformation!